Egypt’s interior ministry said it has suspended a group of policemen who allegedly assaulted two physicians at Al-Matariya Teaching Hospital. In a phone interview with privately owned AlAssema Channel on Sunday, Abu-Bakr Abdel-Karim, deputy minister for public relations and media said that Cairo’s Security Chief decided to suspend the lower-ranking policemen on Thursday, when the incident first took place. Abdel-Karim added that the policemen were referred to investigation. “We are always keen to support our relationship with the people through changing the mindset of citizens regarding policemen,” Abdel-Karim. The doctor's syndicate’s secretary general Ehab El-Taher told Ahram Online on Sunday that even after the suspension of the policemen, the Al-Matariya Teaching Hospital will remain closed. On Saturday, Egypt’s Doctors Syndicate decided to ‘forcefully shut down’ Al-Matariya Teaching Hospital, closing the hospital for emergency cases as well, which will be transferred to nearby hospitals like Zeitoun Specialized Hospital. 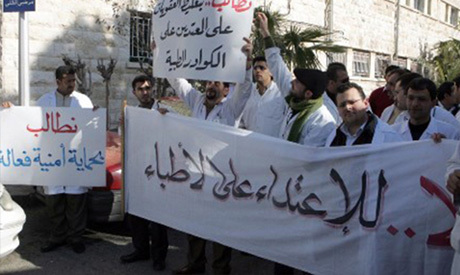 “We will suspend the decision to close down the hospital as soon as the policemen are referred to trial,” El-Taher said. The head of the syndicate Hussein Khairy, the head of the Cairo doctors’ syndicate, and Al-Matariya Hospital physicians will meet the general prosecutor on Sunday and file an official complaint against the policemen. “No one is above the law, a cover-up of crimes and mistakes increases the gap between citizens and the interior ministry,” El-Taher added. According to sources in the hospital, a low-ranking policeman wearing civilian clothes went to the hospital on Thursday morning with a wound on his face, and asked the doctor examining him in the ER to include fake injuries in the medical report, which he refused. In retaliation, the policeman called a group of fellow police officers to the hospital who assaulted the doctor and some of his colleagues before taking them to the police station, where they were later released. The police have said that the man was injured by a drug dealer, adding that when the physician was late or was not convinced that a surgery should be performed, an argument broke out that lead to a fight. According to the syndicate, the two doctors, Ahmed Mahmoud and Moemen Abdel Azeem, were pressured to withdraw their complaints of assault after they discovered that the policemen filed complaints against the doctors. El-Taher condemned the policemen’s use of medical reports on motorcycle accident injuries to claim that the doctors assaulted them. El-Taher called it “fraud” and confirmed that the syndicate will file an appeal on those medical reports. An emergency general assembly has been called for by the Doctors’ Syndicate on Friday 12 February, giving officials a deadline to respond to the demands. "All escalatory steps are available [at the general assembly], leading to a partial strike to protect the dignity of all doctors," the syndicate's statement read. Suspended a group of policemen .... THAT'S THE RIGHT WAY TO DO IT IN A CIVILIZED WORLD... THEN PUT INTO EFFECT The full force of the law and if you are old enough to commit these crimes you are old enough to face the punishments..